You are probably right. I'm just saying it would be great if they were doing it. JOKM stands for what? Joke's on Kip MotherF&@kers!!! B) don't win prize money. Rosie Ruiz aside, the BAA did swoop down on John and Suzanne Murphy, a California couple who won their age brackets (he was 61, she was 59) at the 1997 race. She set a world record time for her age group, yet didn't show up in any videotape checkpoints along the course. Does anyone know what the prizes were for that? They think he collected $300 for being top master at Rochester NY Marathon? Go! St. Louis It appears Kip was 2nd master, but not sure what the prizes were. Missoula he would've collected a wine basket and gift certificate had he NOT been disqualified. Boston Athletic Association will only go so far as protecting the marathon and possibly half marathon prizes. Litton's alleged antics in the 5k were a blip on their radar. On what grounds would Kip sue? He has no constitutional right to run in the Boston Marathon. RDs can accept or reject any applicant. The BA already engage in sexual and age discrimination in the registration process, and there's nothing anyone can do to force them to change their questionable practices. I'm not allowed to walk down the street leading the Thanksgiving Day Parade in my home town. Should I sue because the parade master won't let me participate? Kip may look like a bandit when he starts the race because his bib number is covered, but then at some point he takes off gear (or changes gear) so a bib is showing. it appears this is what he did at Boston 2010. Black long sleeve and black pants to start the race with a black cap on, then close to the finish he goes with a short sleeve shirt (bib showing) and shorts with a different ballcap on. this is one of the (possible) reasons race photographers only have him right before the finish besides just not existing along the course and re-entering the course later on. RE: Rojo says he might start a Kip Litton thread but only 1 and only 1 thread 3/29/2012 4:24PM - in reply to Great news folks! To those that are interested, I've been in discussions with Dukerdog about coordinating the "2012 Kip Litton Boston Marathon Prediction Contest". We did a similar contest in February, 2011 when Kip was going to run in the Cowtown Marathon (he was a DNS). In my gut I think he'll bail on Boston, but I figured we might as well make it interesting in the event he puts on his black sweat pants and lines up in Hopkinton to prove us wrong. Anwyay...we're still working on the specific rules, but the prize structure will be similar. People will submit their entry, and the winner will receive a $5 lotto ticket for a chance to bring home millions of dollars in the MegaMillions drawing. Last year we had a tie. I never heard from either of the winners, so I'm presuming they didn't hit the big jackpot and are still stuck working their day jobs. More information, along with the full set of rules, will follow. I thought Kip would be a no show, but i heared Kip was emailed recently if he's running Boston or not and he replied and said he was. I'm still probably betting on a DNS no show - reason being that if he shows up and runs 3:20, it may look bad for him. Surely net finish/race time is irrelevent. Aren't all the placings/prizes based on gun time only? Which is even more remarkable if he is starting circa 5 minutes behind his age group rivals. If they did this, kip would be disqualified in almost every 2009-2010 race, as Kip likes to start races all bundled up so he doesn't catch a cold. Litton won't turn up as he knows there will lots of eagle-eyed Letsrunners ready to follow him if they spot him. But then again he might enjoy the challenge of outwitting everyone. Game on Kip? I recently met a guy who trains with Kip. He said that their training has been going very well and based on that he is planning to run a 2:46-2:48 in Boston. He doesn't live too far from me, so I'll try to get more info soon. Kip's unpredictable...not sure he thinks about that... even after having race staff from Delaware, Missoula & Deadwood marathons get in contact with each other across the USA about the DQs and the cheating (IN LATE 2010), Kip continued the same crap with Rochester and Charlotte (both sketchy performances). Then, perhaps out of frustration from the numerous DQs, he may have figured cheating was getting too difficult so he started inventing races (i.e. West Wyoming marathon, Sandy Springs half marathon & Pine Hill 5K). When the guy who helped catch Kip's cheating at Missoula (Ouch1000) got in contact with the other race directors, the only race that didn't have a phone number was West Wyoming Marathon which instead had an @live.com email address that was a Rich Rodriguez (Kip himself). 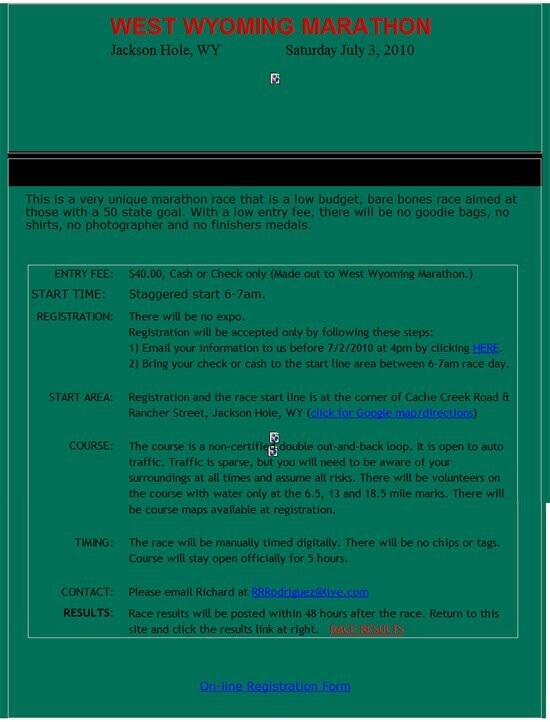 According to ScottH and others, Kip has admitted in writing to inventing West Wyoming Marathon. I believe he has defended it by saying he really did run it but he ran it by himself. The bottom line is the guy is totally unpredictable. he could show up. We've heard car accident and knee surgery rumors, but the latest from an inside source is that he may actually be running. At first, I figured 99% chance he doesn't show. But based on my knowledge from inside sources, I would say there's maybe an 85% chance he won't show, and a 15% chance he will. Are you sure you're not Kip?